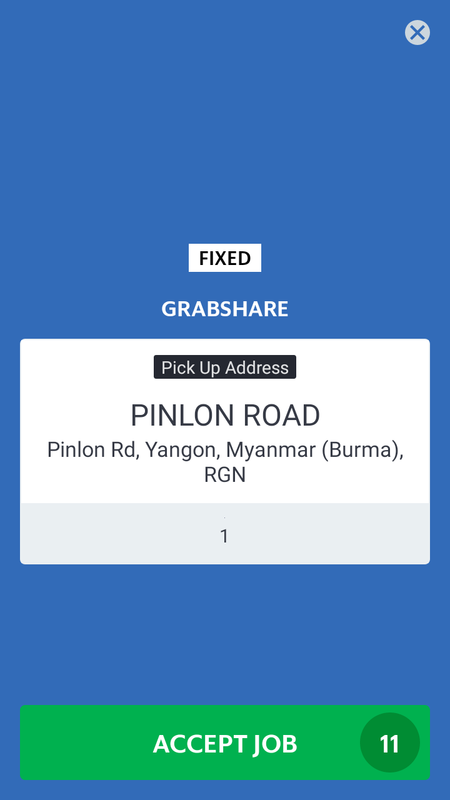 Myanmar’s first on-demand service that allows riders going the same way to share a ride. Earn more for every trip with GrabShare. All GrabTaxi driver-partners will receive GrabShare jobs which allows you to take more than one booking per trip for passengers going the same way. This means you can now potentially earn more by receiving more fares from more matches! 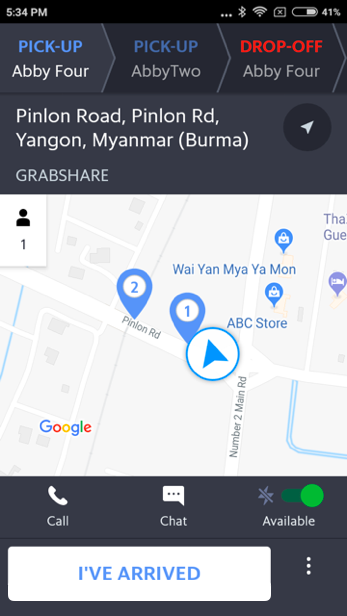 At Beta, GrabShare is only available in Yangon. There are many benefits when driving with GrabShare. Earn more per trip by taking more passengers going the same way. Maximise space in your car by picking up multiple passengers. How is GrabShare different from GrabTaxi? Allows you to take 2 bookings heading in the same direction at the same time. Allows you to only take 1 booking at a time. Take a maximum of 2 passengers per booking. Take a maximum of 4 passengers per booking. 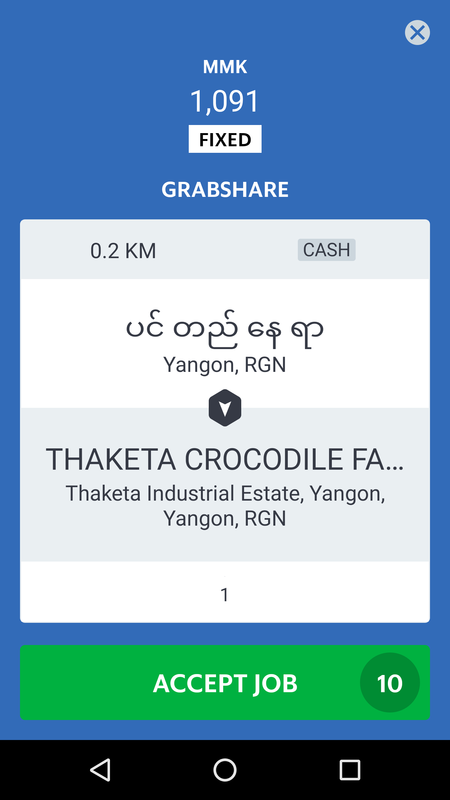 Job cards are blue and labelled “GrabShare” on the top-left corner. Job cards are grey and labelled “GrabTaxi” on the top-left corner. 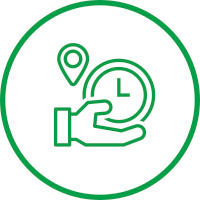 Trust the App – Our app provides the most optimal trip sequence to minimise travelling time. Follow the sequence to ensure a seamless experience. 3 Minutes Waiting Time Drivers should only wait up to 3 minutes for their passengers upon arriving at the pick up point. This reduces overall travel time and all parties can have a pleasant ride! “GrabShare” will appear on top of a job card with a blue background. You will see the pick up point. Proceed to passenger’s pick up point. You may receive a second booking before or after picking up your first passenger. Accept the new booking by your second passenger. Follow the trip sequence from left to right when you are dropping off your passengers and collect your fare. Do I get incentives for GrabShare jobs? Yes, GrabShare rides will be counted towards your existing incentive ride count. On top of that, drivers will get 50% commission back on every unmatched GrabShare ride during the pilot phase. 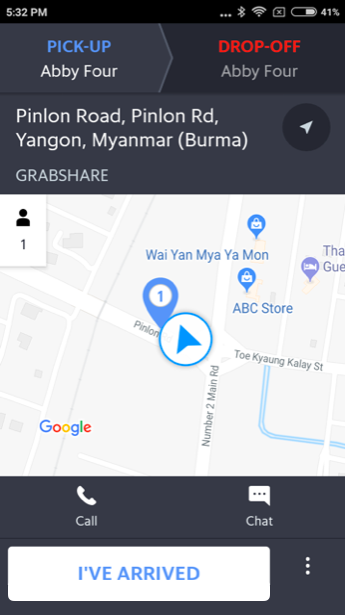 How do I set up GrabShare on my phone? There is no work required to set up GrabShare; it will be available for all GrabTaxi drivers automatically. 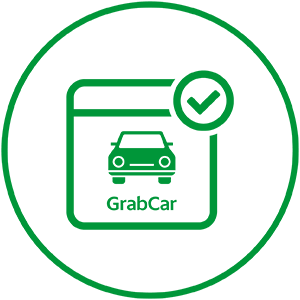 Where do I input payment for GrabShare? This will be the same experience as you have today for GrabTaxi, once you drop off your first passenger, the payment screen will pop up. Once your payment input for the first passenger is completed, you can move on to dropping off the second passenger. How do I switch from GrabTaxi to GrabShare? You don’t need to switch; the job card will indicate whether the job is a GrabShare or GrabTaxi job. Are there different wallets for GrabTaxi and GrabShare jobs? No, each driver only has one Grab cash and credit wallet. The cashout process will also be the same. What should I do if the first GrabShare passenger I pick up asks me not to accept an assigned match? Advise them that by making a GrabShare booking will need to share a ride, and drivers are not allowed to ignore bookings. If passenger gets into an argument, continue the ride until the end and report the passenger to Grab through the Driver Rate Trip feature under “Not willing to share ride”. Can I choose not to receive GrabShare bookings? No, you cannot. Refusing to accept GrabShare bookings will affect your AR. If a booking is unmatched (i.e. only gotten one booking instead of two), will the fares adjust? No, the fares on the app are final. We will protect your earnings by offering a 50% commission back on every unmatched GS ride during the pilot phase. How long should we wait for passengers before cancelling especially for matched trips? You should only wait for 3 minutes per booking. This is different than the GT experience of 5 mins per booking. How much will be debited from driver’s credit balance? We will be applying the same commission rate as GrabTaxi. If I accidentally ignored or cancelled the second booking, can I still get another booking and get matched? Yes, but this will affect your AR & CR so please ensure that you continuously check the app. If the second booking cancels on me, do I get the 50% commission back? In this scenario, it will be similar to an unmatched ride. We will top up your cash wallet with half of the trip commission during the pilot phase. If the second booking cancels on me, will the fares of my first passenger adjust? No, the fares of the first passenger remain the same. During the pilot phase, for this unmatched ride, we will top up your cash wallet with half of the trip commission. What happens if a booking has more than 2 passengers? The maximum number of passengers for each GrabShare booking is 2. Kindly request passenger to cancel and book a GrabTaxi. If the passenger does not want to cancel, you are able to cancel using the reason “More than 2 passengers showed up”. This will affect your driver CR. When can the second booking happen? The second booking can happen anywhere between the first passenger’s pick-up and drop-off points with minimal detour. Can a driver not follow the pick-up and drop-off sequence given in the app? No, you must follow the pick up & drop off sequence in the app. Our system identifies the best route to minimize detours & travel time. We will also remind passengers that drivers will follow the pick-up/drop-off order given by the Grab app. Trust the app!